Home » iPhone Tips » iPhone Applications » How to make homework easier on the iPhone? One of the great things about the iPhone is that there are a number of great iphone applications out there that you can download from the app store. Many of these are free of charge too and most of them will help solve a problem that you might not even have realised you had. Others are simply there to make your life easier and there are a number of applications that can be used to help with homework and any other work you might have such as University or college work. 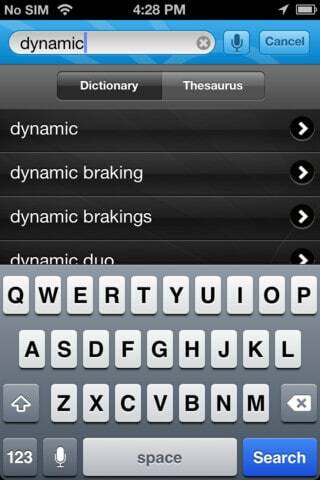 One of the iphone apps that is extremely useful for this is the Dictionary and Thesaurus application. This has been created by the Dictionary.com website and is well known as one of the best applications out there when it comes this area. This app makes discovering the meaning of words as well as new words extremely easy, all from your iPhone device. You could download this app here. Another application that will most definitely come in handy is Penultimate. This is basically a handwriting app and it does work a little better on the iPad, due to its larger screen, but it still offers a lot on the iPhone device. This is great for quickly being able to take notes in any style you like; whether it is pictures, handwriting or anything else. There are many iphone apps out there that are great for education and there is an entire section of the app store dedicated to this.